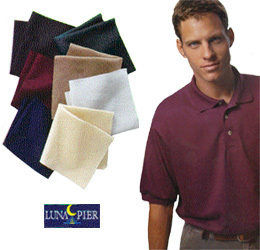 by Luna Pier - Bryan loves to chase that white ball all over a golf course and now you can too in real style. 100% combed ring spun cotton with a mesh texture, raised rib collar, and welt cuffs. Three wood-tone button placket. Taped neck and hemmed bottom. Club 440 logo on left breast and www.bryand.com on left sleeve. An excellent golf shirt! 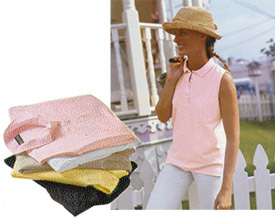 100% Combed cotton, sleeveless crepe, side seamed ladies golf shirt. Clean finish four button placket with pearlized buttons and clean finish side vents. Club 440 Logo on left breast. 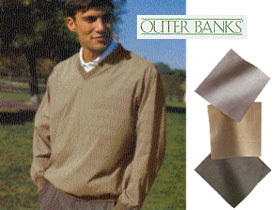 100% Polyester microfiber glen plaid cross dyed V-neck windshirt with Lycra trim. Water and wind repellent. Seet-in side seam pockets with zipper. Club 440 logo embroidered on left breast.